You know a city is serious about food when it builds a giant, purpose built market smack in the middle of the city (Sydney are you listening? Take note please). 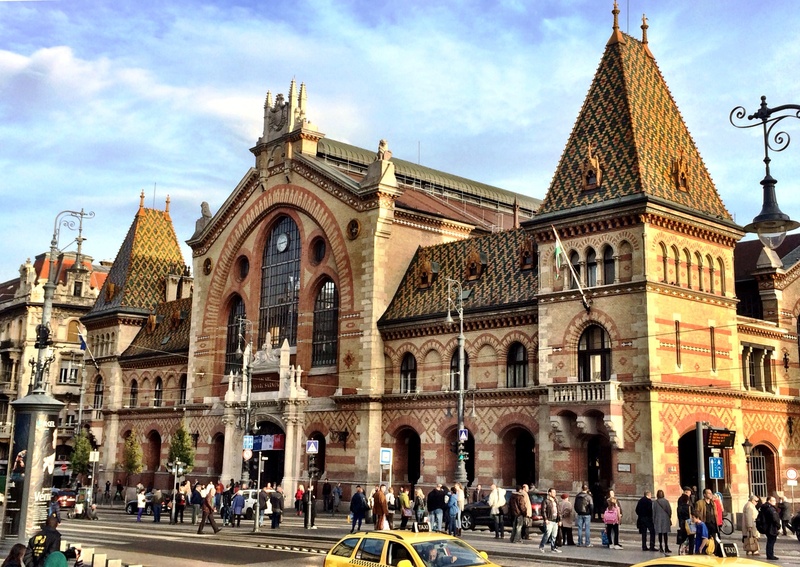 That’s what the Hungarians did in the late 19th century when they built the Great Market Hall. Despite some knocks during the World Wars, a renovation has kept it looking sharp as one of the most beautiful buildings in the city. But it’s what’s inside that is really exciting. 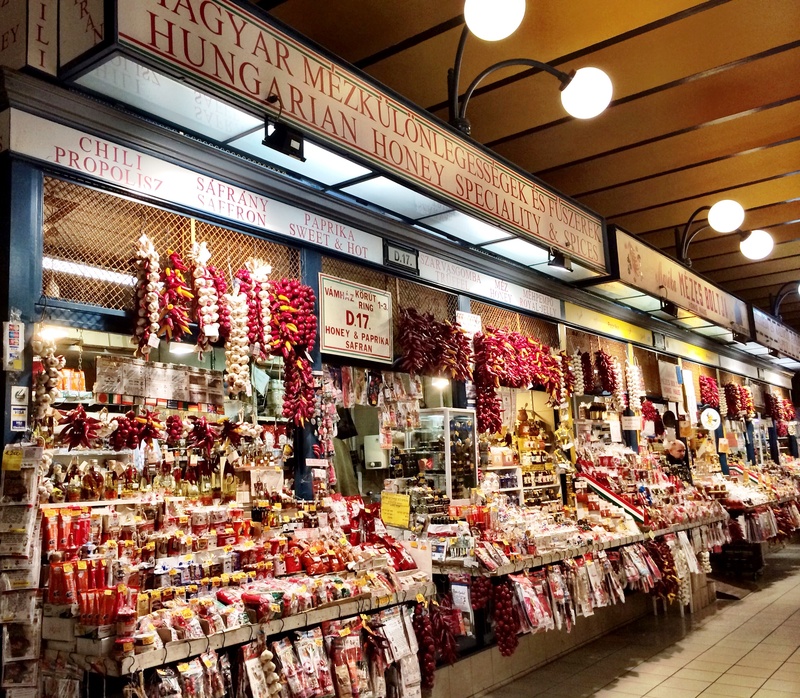 While the first floor features local handicrafts including traditional Magyar dress and collectables, the ground floor and basement are dedicated to food. Rows and rows of glistening fresh produce, endless stands of paprika and chilli and plenty of local delicacies are enjoyed by locals and tourists. 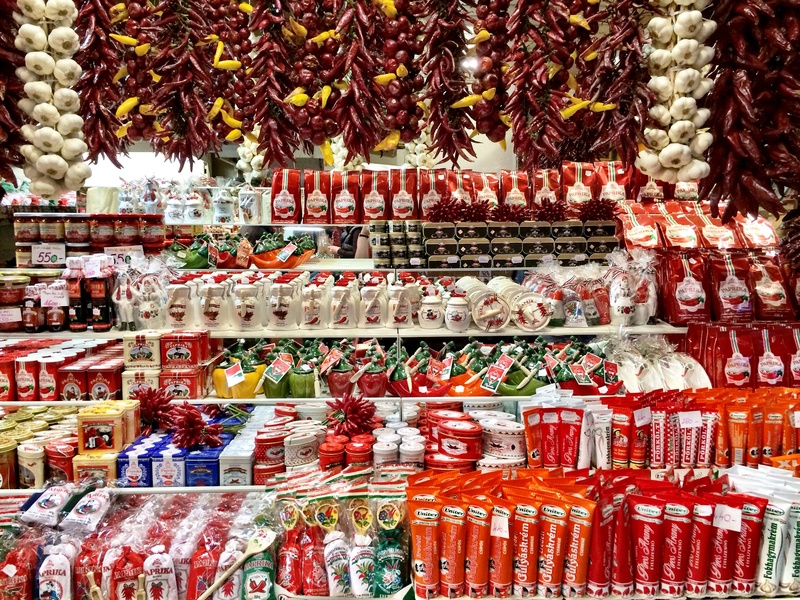 The paprika stands are works of art – sachets, tubs and tubes of the stuff (spicy or sweet) are carefully arranged in colourful rows along with strings of dried peppers and garlic. 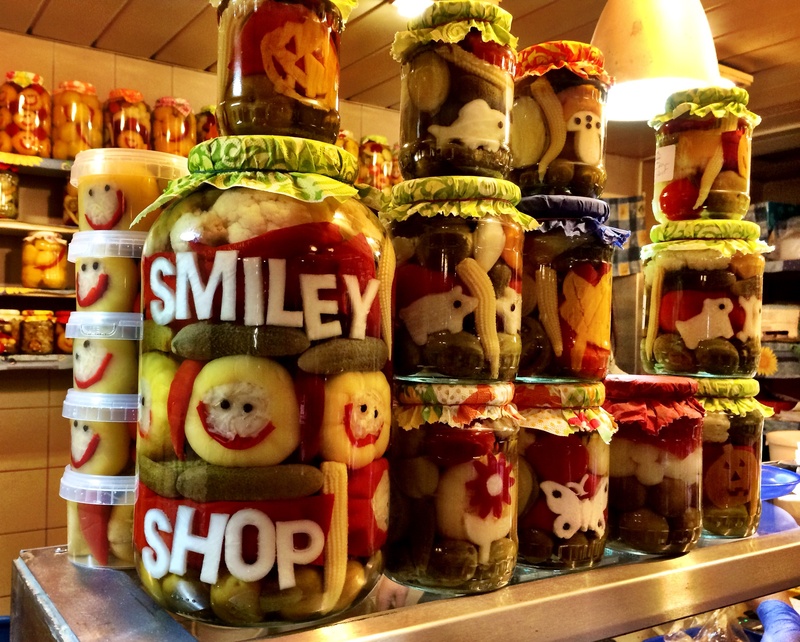 How can you not smile at the Smiley Shop? 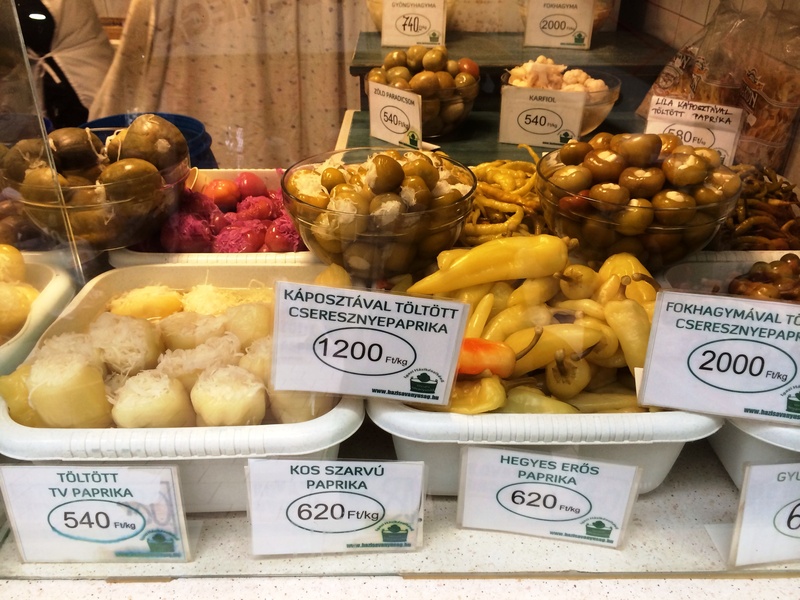 One thing Hungarians LOVE are pickles. Pickles and sauerkraut. They have their own dedicated area – ‘pickle alley’ in the basement floor. 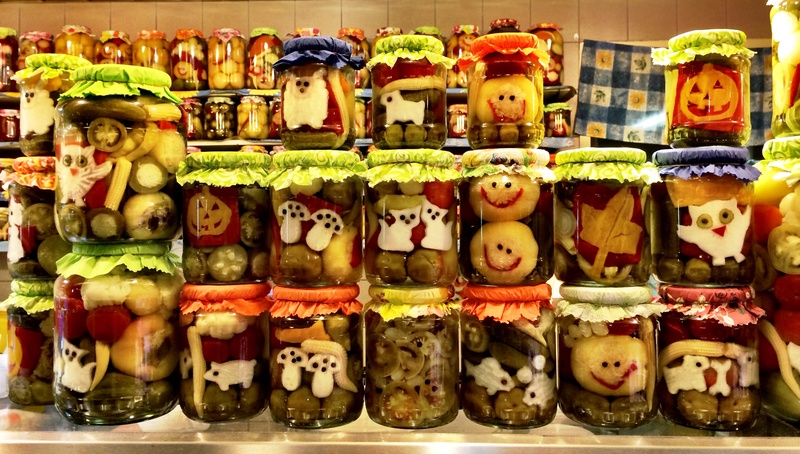 What I especially love is the creativity involved, with jars displaying cute messages and smiley faces made from the pickles, plus a massive array of sauerkraut-stuffed pickled vegetables. If that is all too fancy for you though, you can just go for a pitchfork of the good stuff. 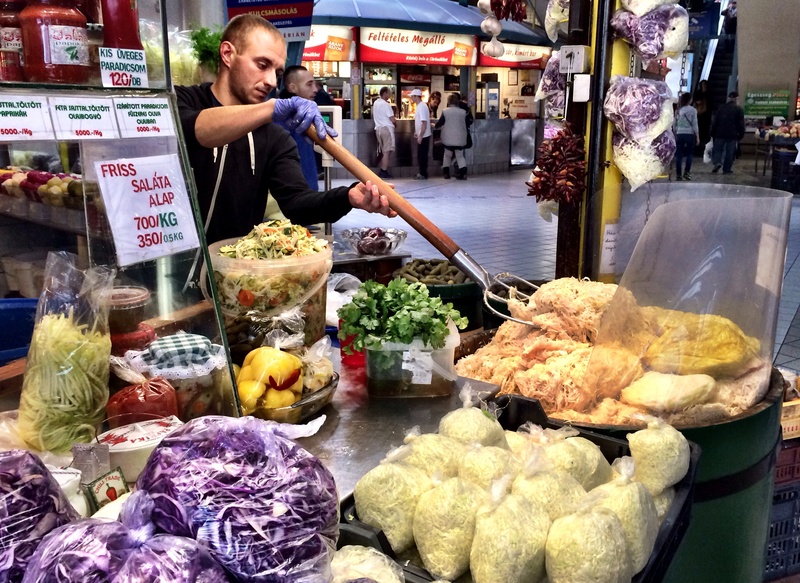 It’s so cheap too – I think Hungarians would baulk if they saw the prices of fermented vegies that are all the rage in Australia right now. The bakery section is one of my favourites, no surprises there. 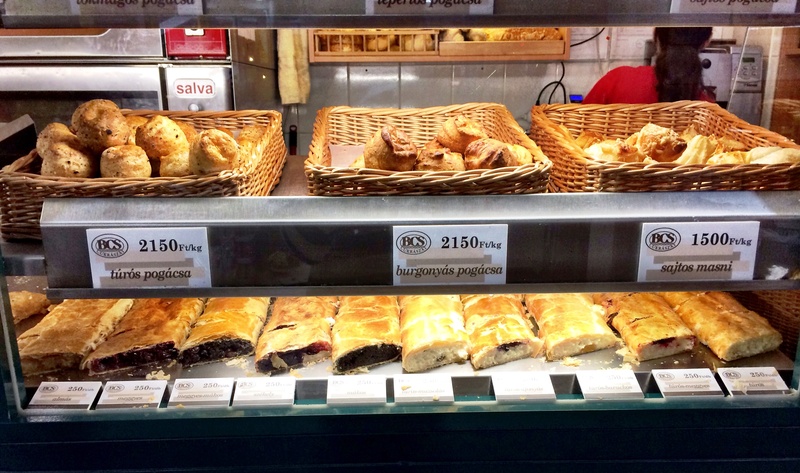 I can never get enough strudel when I’m in Hungary (there’s that genius Viennese influence) and there are always at least a dozen options on offer, from cheese to apple or pumpkin. My favourite pastry is also the most unusual looking – before I tried it I had no idea if it was sweet or savoury but didn’t care when it looked that good. 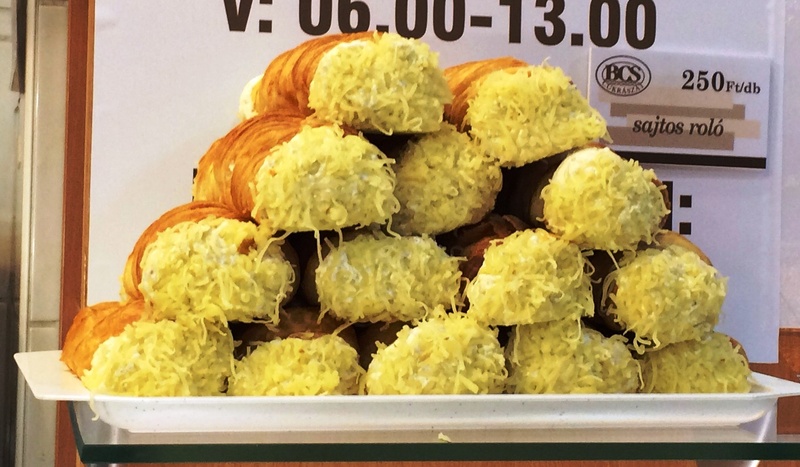 Called sajtos roló, it’s a long piece of pastry filled with cream cheese with each end dipped in grated cheese. It’s both sweet and savoury and utterly delicious. The dairy section is another I gravitate towards, especially when I find a big vat of dark purple goo sitting pretty amongst the cheese. 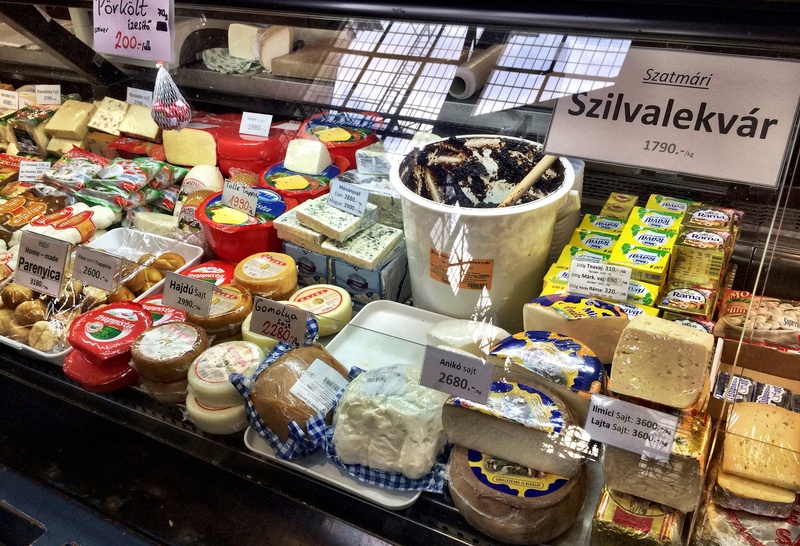 Szilvalekvár is plum jam which is a match made in heaven with the smoked Hungarian cheese I love so much. 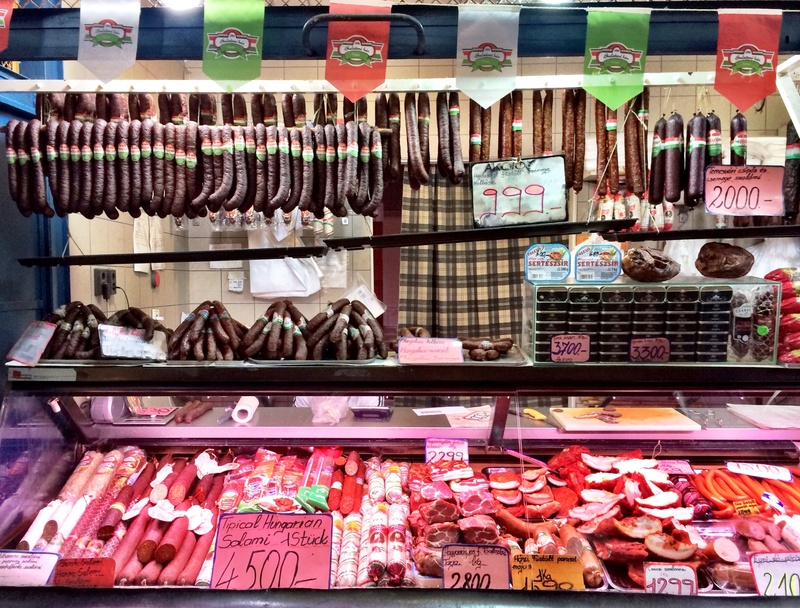 Meat is an important food group in Hungary and there are rows of salamis and cured meats hanging proud, ready to be matched with some of the aforementioned spices. I also spot the coveted mangalitsa pork in the form of sausages and salami. This Old World breed pig is indigenous to Hungary and considered one of the tastiest in the world due to its high fat content. 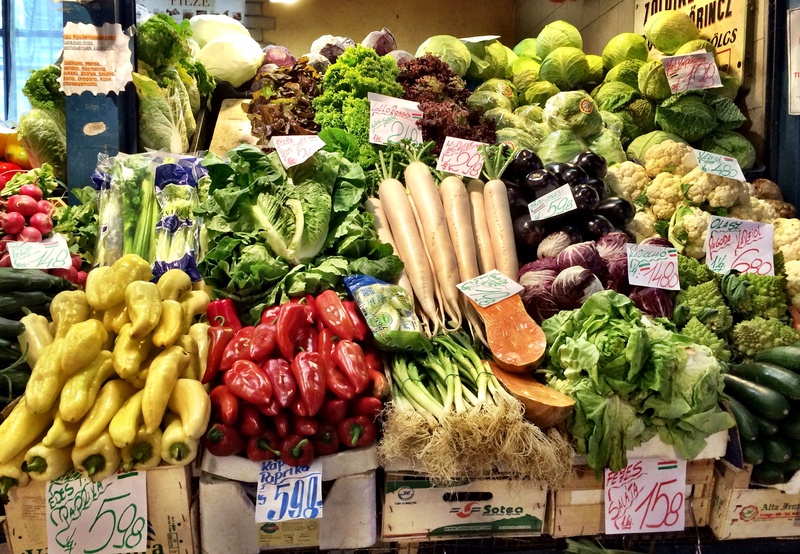 There are plenty of fresh vegetables too, although I don’t find these nearly as interesting as the pickled and preserved variety. 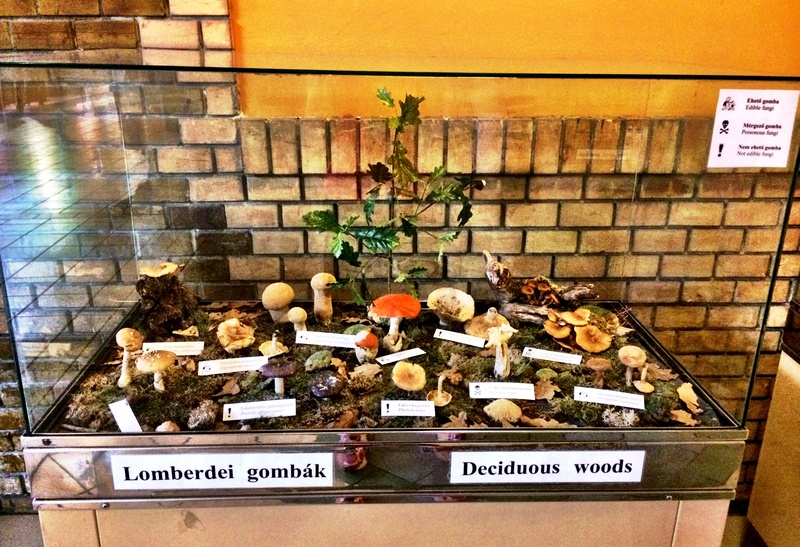 My favourite section of the whole market is (quite surprisingly) an inedible one – a display of all the mushrooms found in Hungary’s woods with a strict key explaining which you can eat and which are poisonous. 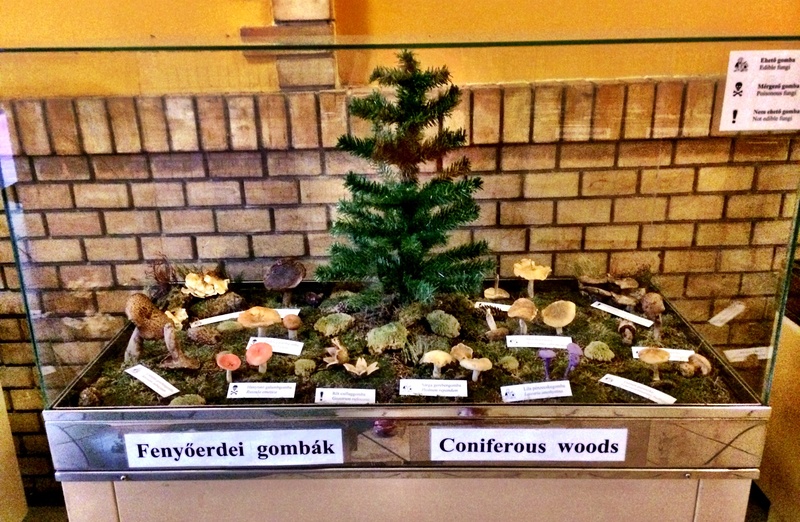 It’s like some kind of quaint science project but I love the attention to detail. 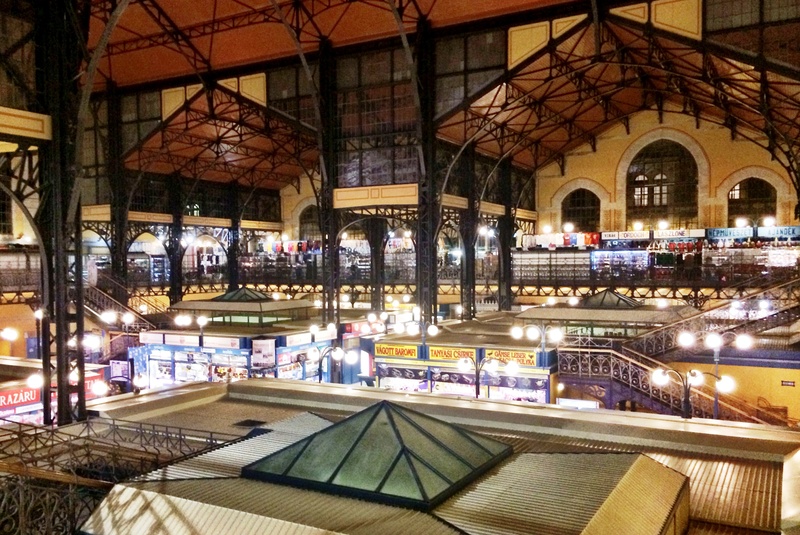 This is my third food market debrief, following Dolac Market in Zagreb and Mercat Olivar in Mallorca. What’s inside a foodie’s pantry? And you made very nice photos! Yes it definitely had a touristy angle, being in the middle of town, but I know lots of locals still visit for their regular shopping. I also like their monthly pop ups which focus on a particular cuisine or region. Wow sauerkraut with a pitchfork! Interesting! I really wish Sydney had a place like this too.